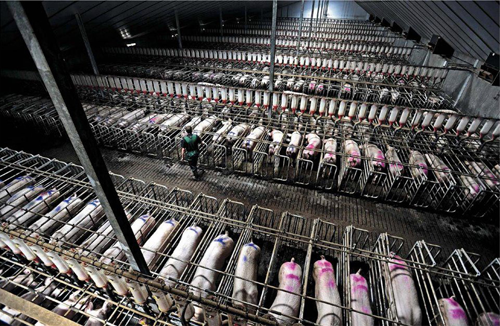 As various investigative reports and documentaries have made clear by now, the environmental impacts and animal welfare abuses of CAFOs (confined animal feeding operations) are dreadful and should be reformed or abandoned if we wish to achieve a just and sustainable society. ..makes me wonder: by some measures, could the CAFO be more sustainable? It is a highly efficient operation where manure can be harvested, "byproducts" are recycled*, animals are given just the right amount of feed, meat is processed at scale on site, incoming feed and outgoing products are transported in bulk, etc. Based on a quick google search, organic pork is $22/kilo, and conventional is $13: So $1 buys 45 grams of organic pork, and 77 grams of conventional pork. If we take a some "basket" of sustainability factors -- land use, water use, fuel use, and chemical use, for instance -- and compare the environmental impact of the dollar spent on each kind of pork, which is more sustainable? How would this compare for other types of livestock? *Meaning, parts of the animals that can't be sold are often ground up and put back in the animal feed. I have an incomplete answer, but at least this is something to get the conversation started. At the bottom of your comments, you restate the question as "is organic any better because it costs more, meaning consumers buy less?" Throughout this sustainability Q&A forum, there is a misunderstanding that sustainability equates to the minimization of inputs/outputs rather than the restoration of cycles of nutrients and the balance found in ecosystems that allows for life to generally flourish. Taking the second definition, there are more factors to consider than the cost per kilo in terms of land or dollars. 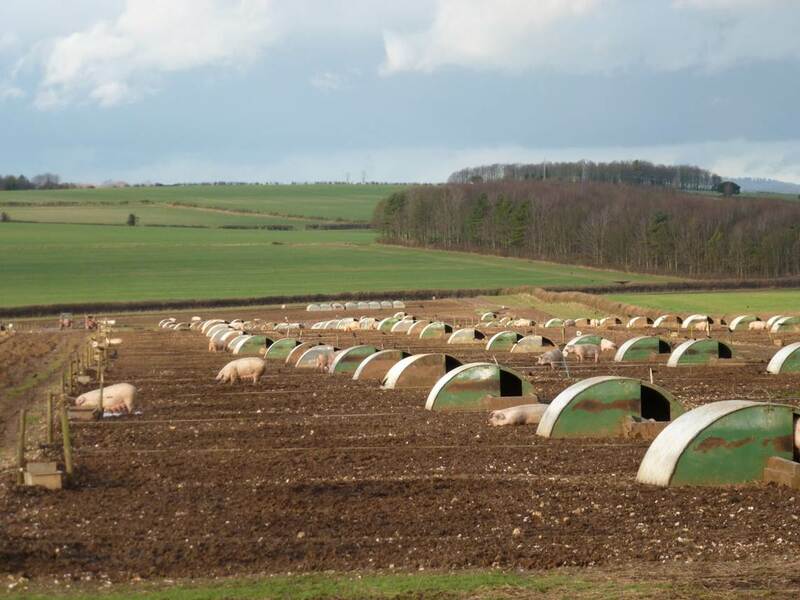 The more compact the livestock is arranged, the more artificial controls must be implemented to make that system work. As the livestock is compressed, animals are closer to one another, more stressed, and less healthy. All of these facilitate the spread of disease, increasing the need for antibiotics. The meat produced in a high-stress, high-disease environment is less good for human consumption. Thus, a kilo of meat from a CATO is not equivalent to a kilo of meat from an organic facility nor a super-eco facility where livestock roams around and eats its more natural diet rather than industrial feed. Organic meat regulations (in the USA) require that animals are fed organic food products (which use less pesticides and fertilizers and are therefore better for their environment), are not fed animal waste, are not given growth hormones nor antibiotics, are not irradiated nor genetically engineered, and are raised in a way that does not harm native species and natural resources, and have a minimum amount of time on pasture land. These restrictions not only increase human health and animal well-being, but also the environment because they reduce the contamination of ecosystems with excess fertilizer, hormones, antibiotics, GMOs, etc. For example, the use of antibiotics in livestock operations contributes to the development of antibiotic-resistant bacteria, which is a growing health concern as more and more people get sick with antibiotic-resistant disease. This question also assumes that there is no ethical factor to consider when comparing these operations, which makes no sense to me unless you are interested in a purely theoretical exercise since any decision made in real life takes into account some basic ethical guidelines. Thus, I would answer your question, saying that yes, organic meat has benefits in terms of ethics, the quality of the meat, and the long-term health of human bodies and our ecosystems. Your original question at the top of your post is impossible to answer definitively without some clarification as to how you would like to compare two different meats - one full of bad byproducts and pumped up with chemicals, and one with less. This is all, of course, assuming that eating less meat is not an option, which of course in most cases it is. cost[s] that [are] suffered by a third party as a result of an economic transaction. In a transaction, the producer and consumer are the first and second parties, and third parties include any individual, organisation, property owner, or resource that is indirectly affected. Externalities are also referred to as spill over effects, and a negative externality is also referred to as an external cost. Of course, we are making numerous assumptions here: in reality, the amount of damage could be higher or lower, in addition to the fact that it is notoriously difficult to determine. But again, assuming this simple scenario, we are left with the question: is it better not to cause any damage, or to cause the damage while producing the money to repair the damage at a later date? Looking at the question in this way, it becomes clear that unless some aspect of organic farming is exponentially more expensive than traditional farming, it makes more sense to prevent damage in the first place, than to save a bit of money up front which later will be needed to repair damage. Additionally, I think a strong argument could be made that organic farming is still better even if traditional farming saves more than enough money to pay for it's own damage. Perhaps there's an economist out there who could comment? Not the answer you're looking for? Browse other questions tagged ecological-footprint animals farming organic pigs or ask your own question.